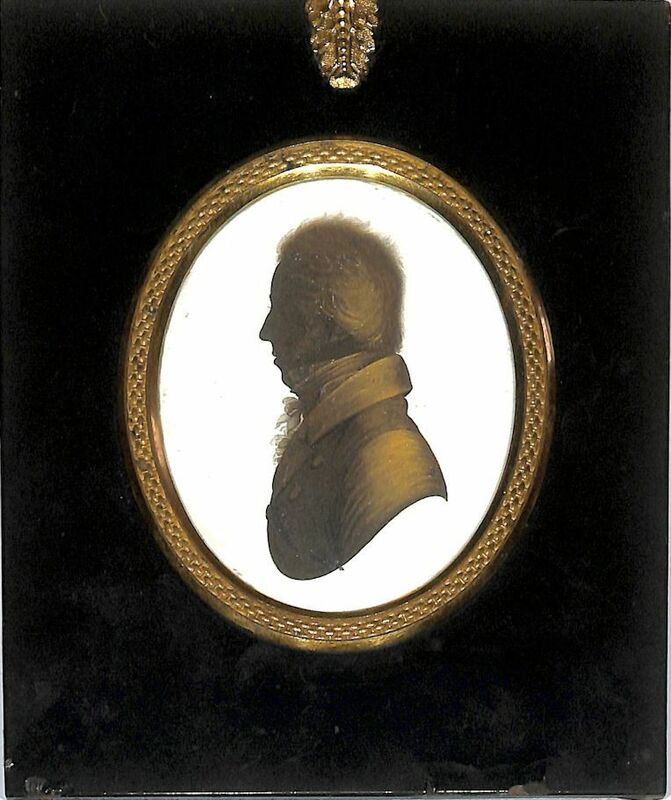 John Field (1772-1848) is prominently placed amongst the finest and most collectable silhouette artists working during the late eighteenth and early nineteenth century. His career began during the 1790s when he was taken on as an assistant to John Miers in his studio on the Strand. That opportunity transpired into the start of a lifelong friendship and a prolific partnership that only ceased when Miers died in 1821. The business was at that point jointly willed to Field and Miers’s son, William, but the dynamics had clearly been altered too much as within a few years the business filed for bankruptcy. Field continued to paint profiles during the 1830s but from a studio that he now shared with his own son. This example of John Field’s work is dated December 1818 and shows Henry Hope (friend of Captain Bodmin whose profile was also painted by Field, perhaps even on the same day) in a double-breasted coat, frilled chemise and stock. 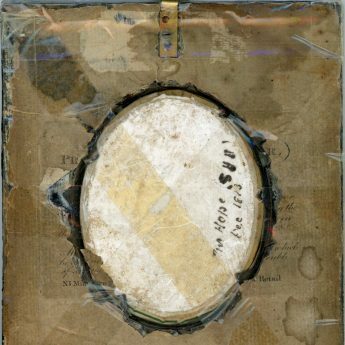 Painted on plaster and set in the original papier-mâché frame with a decorative surround and leaf hanger, the profile is backed with a small remnant of the artist’s trade label no. 12, in use between 1810 and 1821. Under a glass, there are scattered spots of paint loss to the profile though these are not actually visible to the naked eye so will not distract when the silhouette is hung. 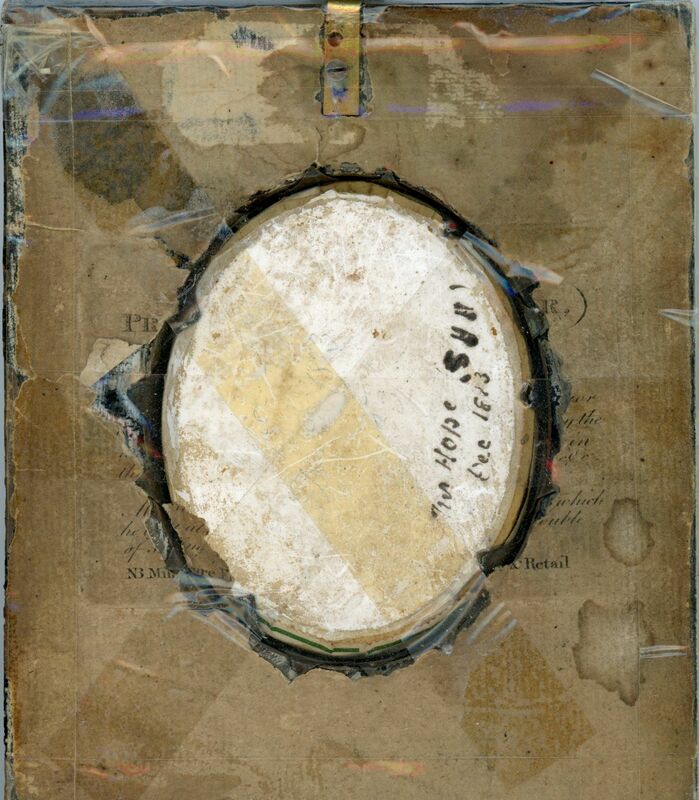 The frame has a little flaking to the veneer along the bottom edge; the reverse side has been covered with cellophane to protect from dust.